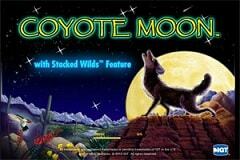 Players will take a trip to the North American wilderness in IGTs’ Coyote Moon pokie, that comes packed with images of the native wildlife and desert landscape, and also packed with a few nice bonus features to make their journey more rewarding, with stacked wilds and a free spins game with a richer mix of symbols on the reels. Inspired by their successful Wolf Run pokie, Coyote Moon comes in a classic 5-reel format, with symbols presented in 4 rows and running across the game, there’s a total of 40 paylines. This gives players a minimum bet per spin value of 0.01, which activates just a single line, and they can adjust up from there to the maximum of 80.00 for each spin. Standard wins come whenever 3, 4 or 5 matching symbols come to a rest across an active line, although it will need to run from the left side on sequential reels to be worth a prize, while scatter payouts occur in any positions. Unlike most pokies set in the American wilderness, this game makes a welcome change by moving the action from the frozen North to a much warmer desert climate. Although it’s all but obscured by the reels, there’s a picture of the desert at night forming the backdrop to the game, with the title above and colourful payline indicators to the sides, showing where each line starts and finishes. In common with many pokies, the playing card 9, 10, J, Q, K and A symbols form the smaller winning combinations, with each of these set against a Native American design, which adds a bit more to the overall theme. Playing card wins range from 5x, 20x or 100x the line bet when 3, 4 or 5 of the lower value symbols stop on the reels, up to 5x, 50x or 150x for the K and A icons. A cow skull and a lizard are each worth 20x, 75x or 250x for the same combinations, and going up in value we see a hummingbird and a stag, which will each pay out 25x, 100x or 400x the line bet. The most valuable symbol however, is the game logo, which sees a wolf howling at the full moon. This returns wins equal to 50x, 200x or 1000x the amount staked per line when it lands on 3, 4 or 5 reels across an active line, and also acts as the wild symbol. The ability of the wolf to act as all other symbols, apart from the scatter is the bonus feature that players are likely to see most frequently. By substituting for others, it can help to create extra winning lines, so for example, if the lizard symbol landed on a line on reels 1 and 3 it wouldn’t be worth anything, but if the wild was in the right position on reel 2 it would act as another lizard and players would win a prize. The scatter symbol is an abstract image that looks like a cartoon lizard with a stomach ache. Whatever it is, it will pay out 2x the total stake per spin when landing in any 3 or more positions, although it can only stop on reels 2, 3 and 4. Once the win has been credited, players enter the main bonus feature of Coyote Moon, with 5 free spins playing out. Everything switches to a night time scene in what’s called the Rising Moon bonus, but the values for each symbol remain the same, although as more wild symbols are added to the reels, the odds of picking up a win or two is greatly improved. More scatters can re-trigger the round, with an extra 5 free games added to the end of any still to play and in theory, this can happen over and over until the maximum of 255 free games has been awarded. Realistically, this is fairly unlikely to occur, but it’s nice to know that it’s possible to get more than 5 spins in the bonus round. Coyote Moon might not be the most sophisticated pokie ever seen, but it’s got a classic design that sticks to a popular theme, and enough bonus features to keep players engaged without over-doing it with multiple rounds. It’s worth pointing out that because the symbols are in 4 rows, rather than the more usual 3, it can be bit more difficult to get symbols landing across a payline, and with 40 paylines available, players may see fewer winning combinations appear. The pay-off is that wins tend to be comparatively bigger, so overall, this pokie is a good game that will surely appeal to the many players who like the theme.